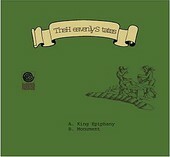 Released on Election Day, November 2, 2004, The Heavenly States' three-track protest single, King Epiphany, is even more valid now that Bush was re-elected (but let's not get into that). Besides the lyrical depth and message here - which is very important - The Heavenly States deliver high-octane, sing-along indie-rock rooted in power-pop and guitar-rock, complete with soaring hooks, undeniable melodies, and enough power to get your juices flowing. Then there is "Monument", a relaxing, gentle indie-pop ditty to help you settle down after they work you up. I'll give it a C+. Two songs, three tracks just goes by too quickly and makes you long for more.